Portrait of Felipe IV, made by Velázquez in 1623. Museo del Prado (Madrid). King of Spain, born in Valladolid in April 8, 1605 and died in Madrid on September 17, 1665. Eldest son of Felipe III and Margaret of Austria, reigned in Spain from 1621 until his death at the age of 60. Although it must be said immediately that he/she reigned, but not governed, being this exercised since the beginning of his reign by the famous valid work Gaspar de Guzmán y Pimentel, count-Duke of Olivares. Deprived of the King until 1643, Olivares was replaced in the post from that year by the more discreet and much less ambitious Luis Méndez de Haro, nephew of the former and owner of the reins of the State until the end of the reign. The custom of having valid to be made by the Government, initiated by Felipe III, was presented as inevitable for the new King very early, this can be a rather fragile, shy and introverted man from his childhood, and more inclined to things of that culture to the political issues. While it showed over time a great dedication to the bureaucratic part of the Government, and not a precise knowledge of the situation of the State lacked in no time, capabilities were always on the side of cultural patronage and worldly issues. Little energetic man, Felipe IV left in the hands of their private management and decision-making, reserving for himself, for example, the cultivation of friendship with painters like Velázquez or Rubens, excellence as rider, Hunter, weapons expert, or delivery to multiple Affairs. Several natural children, of which only recognized don Juan José of Austria, resulted from these Royal activities. The construction of the Jardines del Retiro (see: Palacio del Buen Retiro), in which they came to work about thousand workers day and night, with its palaces, its official and recreation, Lake and its impressive floating theatre buildings, began in 1630 on the initiative of the King. His taste for the arts which also was the work of Calderón, Lope de Vega, Quevedo or Góngora, regulars at the Court, reached maximum diffusion and influence inside and outside the country. His first marriage took place in 1615, and lasted until the death of his wife, Isabella of Bourbon, daughter of Henry IV of France, in 1644. It had at the time of the wedding that would later become Felipe IV ten years old, and his wife six. The union could not be consummated until five years after the actual link. Her nation the first offspring of the monarch: María Teresa, subsequently married to Luis XIV of France, and Baltasar Carlos, died as a child. After the death of the Queen, Felipe IV was remarried, this time with its prima Mariana of Austria, which had three more children: Margaret, who then was Empress of Austria to marry Leopold I; Felipe, died prematurely; and who would be heir to the throne, Carlos II, branded as sickly and nicknamed the Bewitched. The most important feature of Felipe IV as a statesman, was, without doubt, its lack of decisive, essential ability to make important decisions. Dead his mother, Queen Margaret strong, when he/she was only six years old, and come to the throne with just sixteen, after the sudden death of the father, the new monarch was already since age eight with the tutelage of the count-Duke of Olivares, his gentleman of camera. Ambitious, firm and with a precise idea of the rule of Spain, the valid future had already at that early time of fragile will of the Prince. In historical terms, is therefore the reign of Felipe IV, and not the King Felipe IV, the important thing in the process of transformation of the nation and its role on the continent, process at the head of which stood the private Olivares and not the King. Immediately after arrival to the throne the new King, and the privanza its valid, began a series of spectacular corruption politicians of the previous stage. Eager to regenerate the State, perceived, and not without reason, all as an institution filled with ineffective and venal men for decadent, Olivares began a redevelopment policy moral and institutional, aimed at the recovery of a State which, as in the previous generation, still being destined to far-reaching designs. Indeed, the champion of Christendom and orthodoxy outside, began inside the country to clean machinery of government mechanisms before embarking on the conquest of foreign hegemony. The Duke of Lerma, first valid Felipe III, fought to go to prison for his newfound dignity of Cardinal, but was fined and banished from the Court; the Duke of Uceda, son of the above, and also private of the King, went twice through the prison; moved to fray Luis de Aliaga, confessor of Felipe III, the Duke of Osuna, along with their servants and friends--among them, a disappointed and resentful Quevedo- taken by force from his residence and also imprisoned. Finally, and producing a big popular impact, a much hated character, Rodrigo Calderón, was executed in October 1621. Successive plague epidemics, poor harvests, and the significant decline in imports of precious metals from the new world, made more dramatic still bleeding in men and money demanded by the maintenance of the Empire. The fight against corruption and policy austerity (at least, of moderation in spending), both public and private, undertaken by the Duke, woke up some excitement by attempting to make more effective the State to be able continue exercising - and expanding - your role as imperial Catholic power. The success of the regeneration company was, however, more scarce. The big three paragraphs that dealt the famous memorials, something like the programme of political reform driven by the valid King, boarded an administrative reform, a socio-economic reform and a more ambitious (and, ultimately, fatally-decisive in the process of decline of the Spanish monarchy) constitutional reform. Felipe IV crowned with olive groves. Juan Bautista waterfall. The most significant novelty in the institutional field were boards, commissions specialized in different branches of the economic activity of the country and theoretically formed by experts in each of the subjects that replaced the Councils; up to a total of seventeen, these boards were baptized with the following names: execution, Navy, Media Anata, Papel Sellado, donations, Admiralty, salt, mines, Presidios, populations, skills, works, forests, cleaning, Chambers, million and reformation of manners. Rules were enacted to reduce by a third the number of municipal charges; Lords ordered that they limit the number of cars, the template of servants at your service - so they could be used in the field and industry, to the excesses of the fashion restrictions were imposed in the dress, etc. In this latter field arrived to confiscate lace, silks and lace. To combat the depopulation, were promoted marriages, freeing them from certain taxes, and increasing, at the same time, the loads on the singles with more than 25 years. In the same vein, was forbidden to emigrate without Royal license. Most of the measures, however, did not pass the threshold of good intentions. "Three years after - writes Elliot - was not the great panorama of reform rather than the modest accomplishment of the abolition of the Ruff". In general, new institutions were found, in addition to the precarious economic situation, a tiny, little able mainly venal class administrative to take forward the proposed changes. In the order's finances, the count-Duke projected something as a national banking system, which, with the Real estate as collateral, paid and received money from individuals, while funding to the State. At least until the crisis of 1640, Felipe IV was fully identified with the line of Government marked by its valid. This crisis, which placed the monarchy in a situation of confrontation with its peripheral realms, erupted because of a legislative reform which aimed to adjust the tax system to the needs of the Kingdom of Castile. Economic, but also military, necessities of war maintained both in Central Europe and the Italian possessions. The POPs armed crisis of 1640 were developed on three fronts. On the one hand the attempt at secession of Catalonia, and the secession of Portugal; on the other hand the Andalusian, Aragonese conspiracies, and the Italian riots; and, finally, the bizkaian riots, Andalusian again and secessionist conspiracy navarra. In the project of the count-Duke (which remains an explicit statement in letter to Felipe IV of 1625 of "Cro-Magnon" realm), the marriage of weapons (1626) was essential to create an authentic Spanish army. To obtain men and use tax burdens to the various peninsular kingdoms could contribute without restrictions, the legislative unification should impose relentlessly. The Union of weapons, intended to form a common reserve army, maintained proportionately by all the kingdoms of the monarchy. From the Catholic Kings, maintained by different kingdoms wars were considered strictly dynastic Affairs, lacking the military conflict of the national character that the new law imposed him hopelessly. The deep-rooted mistrust toward Castile was permanently embittered and erupted in fighting with secessionist aims. More money, more men, and as a corollary, greater centralization of political-institutional, in order to continue the fights efforts to maintain and expand the imperial leadership in Europe, led to an internal explosion that ultimately end up with the dream of a leading Spanish Catholic Empire of the West. 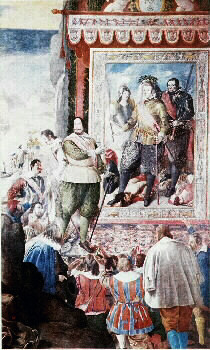 The Corpus of blood (Els Segadors war), in June of 1640, began the uprising in Catalonia. Although these facts have set the year that heading the entire period of the crisis, already in 1631 a first mutiny took place in the Basque country. December 1, 1640 Portugal is insurreccionó and then followed adventures of smaller, as the Seville conspiracy headed by the Duke of Medina Sidonia and the Marqués de Ayamonte in the summer of 1641, the conspiracy in August of 1648, led by the Duke of Híjar in Aragon, and other less significant in Navarra, Sicily and Naples. The limited autonomy of the Spanish possessions in Italy prevented them from effectively opposing the actual impositions; the riots of the lower Andalusia, Aragon or Navarre had much less secessionist entity; but the historically unique personality of Catalonia and Portugal, as well as its greatest strength, yes broke the balance of the monarchy headed by Felipe IV. The Catalans came into contact with France and paid a 3,000 French army to fight against Castile. France, with ancient interests in the area, ended up involved in the armed conflict and in 1642 conquered Roussillon and entered in Monzón and Lleida, being Luis XIII of France appointed count of Barcelona. Felipe IV troops recovered the two cities and the King swore to then respect the Catalan constitutions. The war nevertheless lasted several more years, imbricated in which Spain and France kept the examples more general of the Guerra thirty years (1618-1648). Unanimous and popular, the Portuguese secession (preceded by uproar in 1637 in Évora and other cities) triumphed from the first moment. Portugal won the support of France and England and the Duke of Braganza was elected King. The done, in addition, that Spain was embroiled in the war of Catalonia prevented the Crown vigorously tackle this new focus of revolt. In 1657 the Portuguese entered Spain and threatened to take Badajoz. In 1659 (peace of the Pyrenees) they lost the support of the French, but they continued counting with England, with which it signed an Alliance in 1661. In 1663 the son of Felipe IV, don Juan José of Austria, was defeated in Ameixal and, in 1665, a new Spanish defeat, this time by troops commanded by the Marquis of Caracena, took place in Villaviciosa. Finally, the independence was recognized in 1688, three years after the death of Felipe IV. The Spanish imperial tradition still the same importance in earlier periods both for the new Government as for the generation of the Baroque. The reign of Felipe IV began this with the hope of regaining the power and splendor of the old times also in international politics, through an intervention at all costs to counteract the increasing loss of hegemony in Europe. The truce of twelve signed by Felipe III with the Netherlands finished arriving at the throne of the new King. The war then resumed and was transformed into a conflict of economic root. It was not only the desire for independence of the Spanish possessions in Flanders, but that new commercial power Dutch, attached to the piracy practiced by his fleet, was threatening the Spanish monopoly on exports of spices, sugar and slaves to the new world. Although pressed by the Councils of the Indies and of Portugal to resume the war, the Duke did not restart the fight but act in coherency with the interventionist political plans laid out at the beginning of the reign. Two major naval defeats inflicted on the Dutch (one front of cabo de San Vicente and other American coasts), as well as other victories obtained by the thirds of Ambrosio Spínola in the Netherlands, gave Felipe IV advantage in the conflict. In 1622 the imperial army defeated in Fleurus Juliers, Breda was taken in 1625, and the control of the Valtellina was obtained in 1626. That same year, England sent an expedition to Cadiz, opening up this new English front, which lasted until 1629. In 1631 the Swedish army defeated in Leipzig flamenco Tilly, who, under the orders of Felipe IV, five years earlier had defeated Cristian IV of Denmark in Lotter; a counter-offensive in Nördlingen of the Spanish thirds under the command of don Fernando Cardenal-Infante defeated in turn the Swedes, whose victory Spain obtained through German territory an outlet to the Baltic. The fierce fight, which, with advances and setbacks, seemed to not finish leaning in favor of any of the contenders, is radically transformed to intervene in the war France, to turn the conflict into a duel between the two powers, already immersed in the conflict, economic, religious, political and cultural as the thirty years ' war. A shootout that channelled two different power conceptions: the dogmatic and Orthodox Catholicism Spanish, on the one hand, and the rationalist and innovative France, on the other. In 1636, don Fernando invaded France and won a major victory at the Corbie, very close to Paris, but the difficulties of supply and the danger of losing Breda imposed to end the withdrawal of its troops to their previous positions. In 1637, in a new turn of the situation, the Dutch recovered Breda. In 1639 they began a series of stakes against Spain that culminated in a few years with the complete defeat of Felipe IV. That year the Dutch defeated in the naval battle of the dunes; in 1640 died Cardenal-Infante; and in 1643 was the defeat of the Spanish infantry at Rocroi, which was the hardest hit delivered so far to the powerful Spanish thirds. The last great battle of the war took place in 1647 in Lens, where again defeated the Spaniards. From that time, and with the signing of the treaties of Münster and Osnabrück (peace of Westphalia, 1648), the Habsburg Empire and its desire for European hegemony under the guise of Catholic Christendom sank to make way for a new conception of the continent as a set of States, national free and sovereign, Felipe IV recognizing the independence of the Netherlands. The war with France, however, would last eleven years still more. 1643, year of decisive defeat Spanish in Rocroi, also saw the end of the political career of the count-Duke, died shortly after this date, overwhelmed by a failure that was the of the monarchy. Felipe IV allowed him to retire to their lands, passing the reins of power at the hands of his nephew, Luis of Haro. Here again was the proverbial lack of will of the King, apparently, and despite the full failure of olive groves, all lights had to be encouraged by his wife Isabel and other ladies of the Court, in the so-called conspiracy of the ladies, to dismiss the count-Duke. Another detail, also indicates the need for the monarch to be pushed to act: Sister María de Jesus, Abbess of Ágreda, with a great reputation for mystical and Holy, and with which the King maintained a large epistolary relationship until his death (Felipe IV left a wide margin in the letters that he/she sent to the Abbess, so this there write the answers to the questions posed to him by the King)helped the monarch to take the final decision on the valid failed. The trait more characteristic of a new private, Luis de Haro, was the discretion, both in its business manager, in the objectives that led to the Crown. Abandoned the ideals of the greatness of his ambitious predecessor, the new valid Felipe IV complied with find a honorable peace and least disadvantageous as possible. The possibility of beating France had not been, however, abandoned even by the King. From 1650, the Spaniards seemed to recover positions in the race, giving Barcelona; shortly afterwards, in 1652, the rest of Catalonia, except the Roussillon, was recovered. Finally, in 1654, the victory against France in Valenciennes forced the French to negotiate peace. Luis de Haro, making an inexplicable political mistake, refused an offer of negotiation when the Spaniards were in a position of advantage, and the war continued. Luck switched sides in 1658, defeating the French at the battle of the dunes, set to Luis XIV who failed to take advantage of the Spanish four years earlier to sign the peace of the Pyrenees in 1659. The Spanish monarchy lost definitely the Roussillon and Sardinia, had to give the French the Artois and Franche-Comté and that accept the enactment of important trade privileges for the benefit of the France of Mazarin. The package also included the marriage agreement between the Infanta María Teresa and Luis XIV. Although recovered Catalonia, the final balance of the prolonged crisis in a reign which, unlike the former, was launched to grave open in search of glory and leadership, was the loss of part of the Netherlands, the secession of Portugal and definitive renunciation to direct the destinies of Europe. Died in 1661 Luis of Haro; If Felipe IV did not fear to Olivares, apparently, joined its successor, a sincere affection, falling to his death the King in the hands of sor María Jesús de Ágreda and other dark advisors. The four years that the monarch lived still were bitter at the defeat of the monarchy and of concern before the problematic succession coming: a King with few overtones survive long, Carlos II, four years old at the death of Felipe IV, and a foreign ruler, Mariana of Austria. However, the most valuable legacy of Felipe IV, outside the political arena (which was not naturally gifted), was the undeniable rise of thought, arts and letters, which became the period of the King planet - expression the taste of bombastic Baroque-a brilliant continuation of the mythical golden age Spanish. BROWN, j. and ELLIOTT, J. H. A Palace for the King. The Buen Retiro and the Court of Felipe IV. Madrid, 1984. DEVÈZE, M. L'espagne de Philippe IV (1621-1665). Paris, 1970. Dominguez ORTIZ, A. policy and finance, Felipe IV. Madrid, 1960. 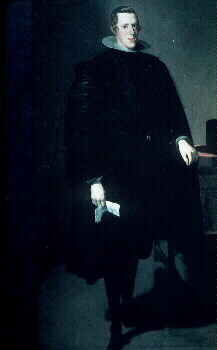 GALLEGO, J. austerity and ostentation in the Court of Felipe IV. Madrid, 1994. HUME, M. The Court of Felipe IV. Barcelona, 1949. JOVER ZAMORA, j. m. (dir.). The Spain of Felipe IV, in history of Spain Ramón Menéndez Pidal, Tome XXV. Madrid, 1986. Pena GUTIERREZ, J.F. from the. Felipe IV, in the crisis of the seventeenth century, vol. 6 of the history of Spain, directed by A. Domínguez Ortiz. Barcelona, 1988. PEREZ VILLANUEVA, J. Felipe IV and Luisa Enríquez Manrique de Lara, Countess of Paredes de Nava. An unpublished correspondence with Velazquez in the background. Salamanca, 1986. BETHLEHEM, J.A. SÁNCHEZ The minor Austrias. The Spanish monarchy in the 17TH century. Madrid, 1996. SILVELA, f. (ed.) letters of the venerable mother sor María Agresa and Mr King don Felipe IV. Madrid, 1885-1886. TOMAS AND BRAVE, F. The valid on the Spanish monarchy in the 17TH century. Madrid, 1963.